Have you ever wanted to be part of the Susan K. Weckesser Inc. Creative Team? Well now is your chance because we are having a Creative Team Call!! 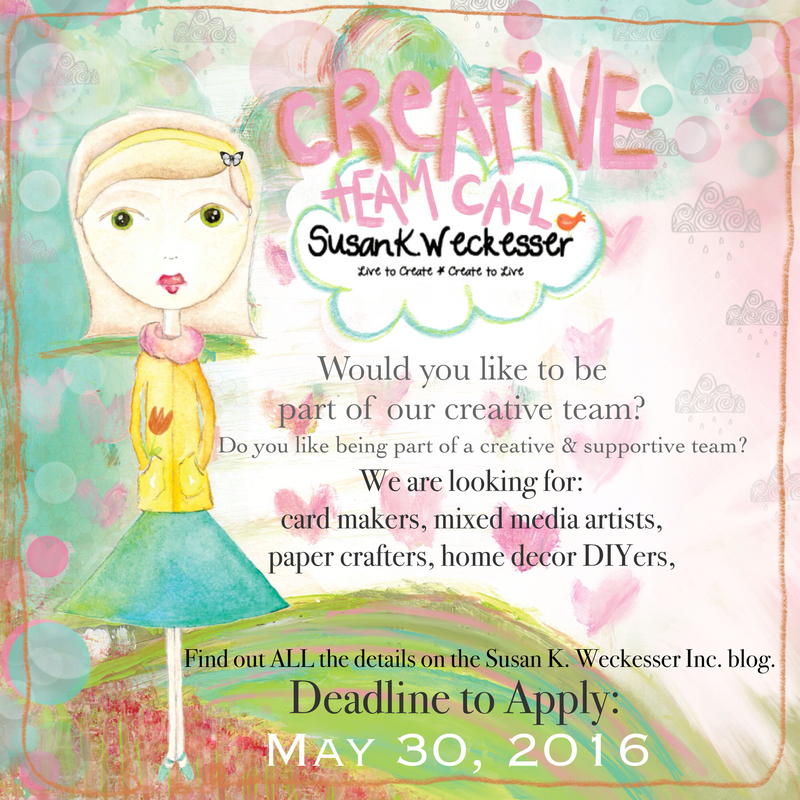 We are looking for card makers, mixed media artists, paper crafters, home decor artists, video specialist. - Our products to create with. - Products from companies that we cross-promote with. - A SKWInc. CT logo for your blog. - 2 blog posts/month on our SKWInc. Blog. - 1 blog post on the CT own personal blog using our products and link to our blog/social media. - To be active on social media, such as Instagram, Facebook, Twitter, Periscope, etc. & promote our products. - To be part of any of our blog hops or promotions. -To be uplifting & inspiring and have fun! Please send the following to hello@susankweckesser.com . 1) Full name, adress, & email address. 2) Please list & include links to all your social media. 3) A biography, including if & with who you have ever been published with. 4) Write a short paragraph about why you would like to be a member of our Creative Team Family. 5) List other design team that you are currently on. 7) optional: if you would like to make videos for SKWInc., please include a link to one of your videos that you would like to share with us. If you have any questions please feel free to email Susan at hello@susankweckesser.com .